Wrestling For Warriors – Fighting for those, who fight daily. A child who has a disability or terminal illness, yet continues to fight against it on a daily basis... all while never showing signs of giving up. On May 7, 2017, we suffered a heartbreaking loss, when Chase Holt, son of the Director of Wrestling For Warriors, unfortunately lost his battle with sarcoma cancer and neurofibromatosis type 2. 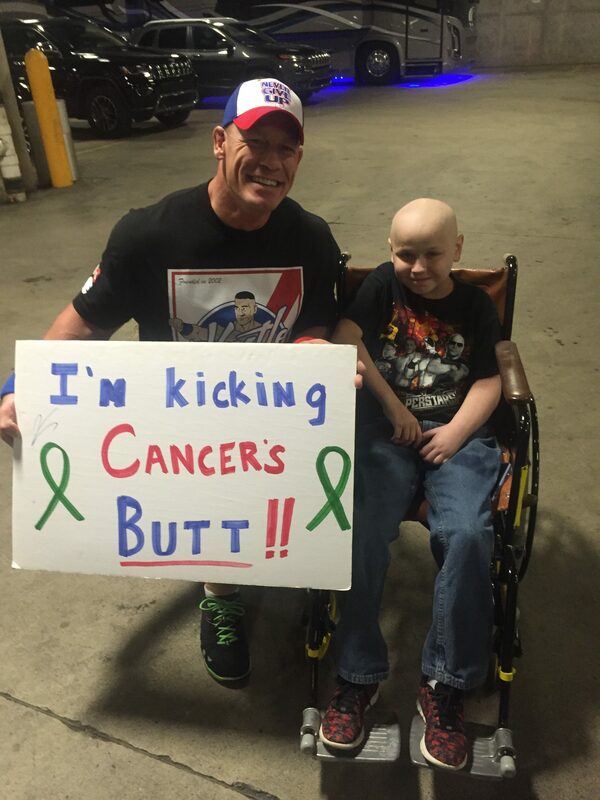 Chase was the inspiration behind Wrestling For Warriors, as no matter what medical stuff he was facing, he would always smile from ear to ear when he got to meet WWE Superstars. Chase realized how fortunate he was to meet the Superstars and wanted to do whatever he could to offer that same sort of experience to other children who were facing similar situations. Chase will be deeply missed by everyone who was fortunate enough to meet him. Want to Help but Can't Make it to a Show? and your generous Tax Deductible Gift will go directly towards the selected cause of the next event. WFW is looking for Sponsors for our Events. The More Sponsors We Have - The More Warriors We Can Help!! When you attend a Wrestling For Warriors show, you will be part of a movement that will change lives! Wresting For Warriors will exemplify professionalism from it’s world class talent to it’s top notch production values. We don’t want you to just watch WFW event, we want you to EXPERIENCE it. From the moment you walk in the door, prepare yourself for a transformative, multimedia wrestling presentation unlike anything you’ve ever seen before! When it comes to our athletes, Wrestling For Warriors will bring you ONLY the absolute best, from across the country and beyond. Utilizing talent from wrestling’s past, present and future, WFW promises to deliver an in-ring product that is top notch. The wrestling aspect provides the platform to highlight our primary purpose: To enrich and change the lives of our WARRIORS! This is what sets us apart from all other wrestling organizations. Here’s the deal: each show put on by WFW will benefit a specific cause relating to a childhood illness. From NF to pediatric cancer to MS to CP and beyond, we want to help as many kids as possible. The MAGIC of professional wrestling knows no bounds. We know firsthand how it can help our warriors who are going through the greatest challenges of their lives. Help us help them! Don’t just watch the show, be a PART of the show! With our Premium VIP Warrior Pass, you will go backstage with the wrestlers. You will get unique photo opportunities with the wrestlers. But here’s the KICKER: you will also be able to walk your favorite wrestler down the aisle and be their special MANAGER for the night! Perfect gift for ANY wrestling fan!! What better way to support a great cause than to be RINGSIDE as you guide your favorite wrestler to victory!? Wrestling For Warriors would like to welcome BeniComp Insurance Co.as a sponsor for the Tried -N- True Pro & Wrestling For Warriors, Co-Branded event “Battle For The Brave” happening on May 11th at the Grand Wayne Convention Center.